No Reservation Obligation except the "Hayabusa", "Hayate" and "Komachi"
Except a few Shinkansen trains during peak seasons, all the trains are coupled on Non-reserved cars. This is for passengers who go to Shinkansen platform directly. Depending on stations, it is impossible. It is like this picture. It is for passengers who cannot go through "Gate for Shinkansen Only". 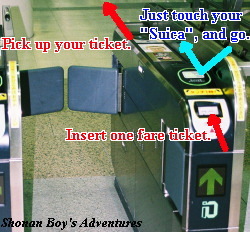 At first, proceed to the "Gate for Present Line", then go through the "Gate for Transfer". They are the people who boarded local train, etc... Then change trains here for Shinkansen, and should go through the "Gate for Transfer" at changing station. I think a spelling "Tokaido-Sanyo" is not appropriate, and correct spelling is "Tokaido-San'yo". These pronunciations are different. Go through the "Automatic Ticket Checker", and insert tickets up to 4 tickets simultaneously. But do not insert other portions tickets. 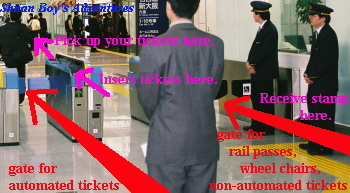 Passengers with Non-automated tickets (Reverse side is gray or white), using rail passes (such as Japan Rail Pass), or passengers with wheel chair should go through "Station Staff Gate". And show your ticket and receive an entry stamp. 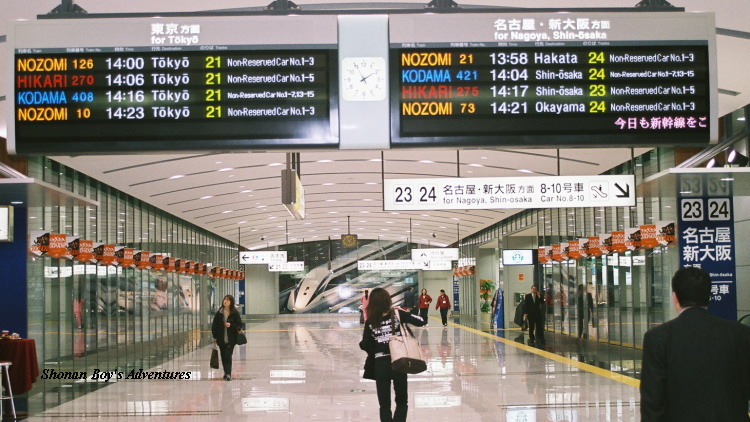 Japanese trains do NOT need to check in such as the "Eurostar" and "AVE". Just go through the gate and wait for your train at the platform in last minutes. Insert one "Fare Ticket" only. Then proceed to the Shinkansen gate, and there insert your tickets up to 4 tickets including fare ticket simultaneously. In Shinkansen, passengers can NOT use the "Suica iO card". It is only for present line. Suica is very convenient card. If you have it when you take a local train, you do not need to buy ticket. Just "Touch & Go". Passengers who cannot go through automatic ticket checker should go through station staff gate. After going through the gate for present line, look for transfer gate. See electric bulletin boards, and check your train and platform. Then proceed to the platform what you will take a train.